Back in the 1970s I attended Foothill Open School, in Monrovia, California. FOS was a private school that a group of parents started in, I think, 1971. I am looking for others who taught at or attended FOS, or the parents of children who went to the school. I am interested in finding out what impact that early open school experience had on us in later life. I would also love to hear from other people who attended alternative and experimental schools in the 1960s and 1970s. If you know of anyone, please send them my way! 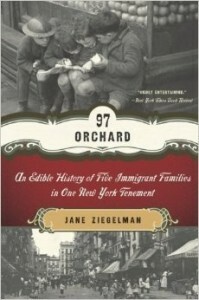 This entry was posted in Uncategorized on March 20, 2014 by Dr. B.
I have been re-reading Jane Ziegelman’s 97 Orchard: An Edible History of Five Immigrant Families in One New York Tenement. It is a great book for learning about the foodways of tenement dwellers and the connections between food, lifestyle, and identity. This is a fish market, and I especially like the vendors tearing up newsprint to wrap customers’ purchases. New York markets were especially well supplied, if somewhat chaotic and run down. This entry was posted in Extras for Students, Food History, HONR 201B, Teaching and tagged early 20th century New York, Fish Market, immigrant foods on February 19, 2014 by Dr. B. As we have been reading Kathy Peiss’s Cheap Amusements in my Honors 201B class I decided to post some brief video of popular dances and amusement parks mentioned in the book. These early films are amazing sources, allowing us to visualize the dances and amusements Peiss describes in the book. Just for fun, here is a clip from Downton Abbey showing the “Grizzly Bear” being danced in the servant’s hall. This entry was posted in Extras for Students, HONR 201B, Teaching and tagged Cheap Amusements, Coney Island, Early 20th century dance, Edison movies on February 8, 2014 by Dr. B. The first is from a teacher who reflects on her experiences teaching for a for profit virtual charter school. This feature article investigates the rise of toast as an artisanal food trend in San Francisco. And finally, this article about a meeting of the elders of organic farming at Eselen that explores the problems of the increasing age of farmers and their difficulties passing on their farms to the next generation. This entry was posted in Extras for Students, Food History, Food Studies, Teaching and tagged artisanal food, food studies, HONR 303T, organic farming, virtual teaching on January 27, 2014 by Dr. B. As the new semester is about to begin my thoughts have turned to syllabi and other teaching related items. This blog is foremost among them. I shall be checking in regularly with ideas that occur to me after class, additional news and other information that might be of interest, and new photos for the gallery page! This entry was posted in Announcements on January 6, 2014 by Dr. B. Welcome to my website. This site is under construction, updates will be posted over the summer. This entry was posted in Announcements on April 22, 2013 by Dr. B.